Birch veneers with walnut accents. Very good condition. These beds were probably produced between the end of the war and the very early 1950's. Johnson Furniture was a "premium manufacturer" in Grand Rapids, MI. These items show exceptional craftsmanship with sophisticated design, attractive veneers, and a rich finish that appears to have also been extremely durable. As with the A5 four drawer cabinets, the dark walnut base seems to make the birch panels "float." Two available, which would make a great King Size bed. 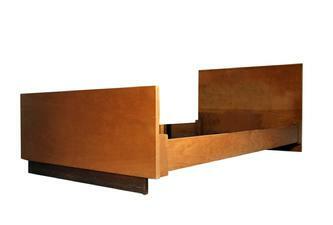 Flexible Home Arrangements by Saarinen Twin Beds #F-29; 1939.